Blue Origin's New Shepard crew capsule streaks away from its booster during an unmanned in-flight abort test over West Texas in this still from a Blue Origin webcast on Oct. 5, 2016. Blue Origin just took another big step toward flying people to space. The private spaceflight company, which is run by billionaire Amazon.com founder Jeff Bezos, conducted a critical "in-flight escape test" of its crew-carrying New Shepard system today (Oct. 5) — and everything appears to have worked just as expected. New Shepard blasted off from Blue Origin's test range in west Texas at 11:36 a.m. EDT (1536 GMT), kicking off today's uncrewed test. About 45 seconds into flight, at an altitude of 16,000 feet (5,000 meters), the capsule fired its onboard "escape motor" for 2 seconds, blasting itself hundreds of feet clear of the booster. This dual screen view from a Blue Origin webcast shows the company's New Shepard crew capsule rocketing away from its booster (which is visible in the inset at lower right) during an in-flight abort test over West Texas on Oct. 5, 2016. That's just what should happen in the event of a real-life launch emergency. Blue Origin had tested the escape system multiple times on the ground, and even used the escape motor to launch the New Shepard capsule in October 2012, during a "pad escape test" in west Texas. But today's flight was the toughest trial yet, because it forced the capsule to "traverse twice through transonic velocities — the most difficult control region — during the acceleration burn and subsequent deceleration," Bezos wrote last month in a blog post about today's test. At 11:41 a.m. EDT (1541 GMT), the New Shepard capsule landed softly under parachutes in the Texas desert as planned, raising a huge plume of dust as it hit the ground. And then, about 3 minutes later, the booster came in for its own touchdown, landing vertically on the launch pad. Blue Origin's New Shepard crew capsule floats back to Earth under its main parachutes after a dramatic in-flight launch abort test over West Texas on Oct. 5, 2016. The rocket's landing was a something of a surprise. Bezos predicted a fiery death for the rocket in his blog post last month, writing that the thrust from the escape motor would likely knock the booster off-kilter, causing it to crash and die in a massive fireball. "There you go, New Shepard! Look at her! What a test!" 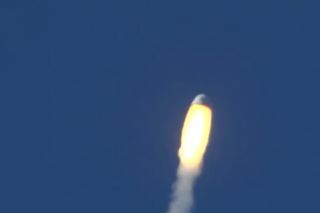 Blue Origin launch commentator Ariane Cornell said moments after the rocket touched down, exhiliration evident in her voice. "I'm going be raising a glass to both the booster and the crew capsule this evening." Blue Origin's suborbital New Shepard rocket lands safely on its West Texas pad after a successful in-flight crew capsule abort test on Oct. 5, 2016. Today's test marked the fifth and final flight for this particular New Shepard rocket. In November 2015, the booster became the first ever to land after a space mission, and it has now repeated the feat four more times. In his blog post last month, Bezos outlined the booster's fate. "If the booster does manage to survive this flight — its fifth — we will in fact reward it for its service with a retirement party and put it in a museum," Bezos wrote.